Right around St. Patrick’s Day, I realized that I was likely to have a surplus of cabbage, though not in time for that holiday. So I started paying attention to recipes for cabbage, regardless of whether they were Irish or not, and I accumulated a few. 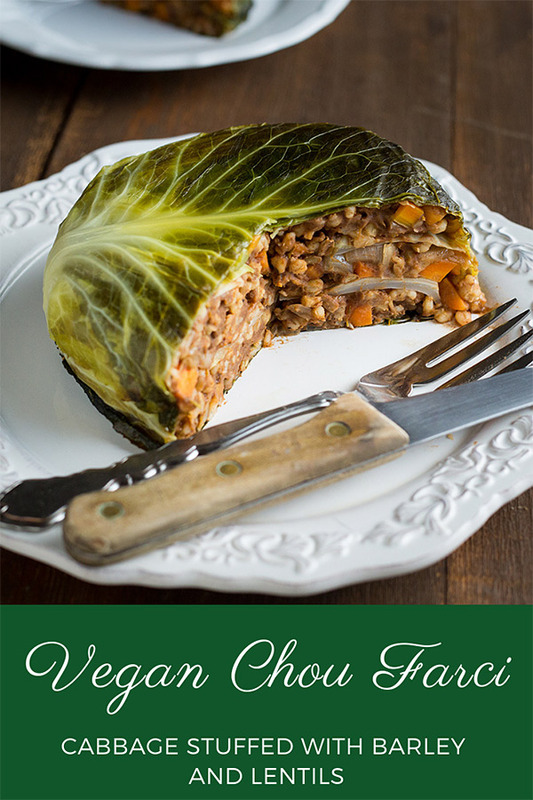 I hope to experiment with both sauerkraut and kimchi in the coming weeks, but first I wanted to make a vegan version of a stuffed cabbage that I noticed in Mimi Thorisson’s beautiful but totally not vegan cookbook, A Kitchen in France. I was mesmerized by the photos in the book, especially for the dish called Chou Farçi. The idea of stuffing a cabbage in a casserole dish rather than as individual cabbage rolls appealed to my lazy side, though after I found the recipe online and really took a look at it, I realized that it was still more complicated than the kind of easy meals I like to make, especially when I started considering whole-foods substitutions for the ground meat it called for. I love using a combination of lentils and grains instead of ground meat, but both would need to be cooked beforehand, making a vegan version of the recipe take much longer than the original to prepare. While I contemplated time-saving techniques, I went ahead and cooked the pearled barley and stored it in the fridge for several days. On my weekly shopping trip, I picked up a can of lentils, just in case I was running short on time. And then it hit me that the “secret” to making this recipe less arduous is to make it a little bit at a time. Even the cabbage leaves can be cooked ahead of time and stored in the refrigerator. The second hurdle that I had to get over was the seasoning. Ms. Thorisson’s version uses a French seasoning blend called Rabelais spice, which she describes as a blend of allspice, nutmeg, and curry. I wasn’t sure whether she meant curry powder or curry leaves, and Google searches revealed nothing definitive because the formula is a closely held secret that its manufacturer is not divulging. The recipe recommends allspice as a replacement, but since I find allspice overpowering on its own, I came up with my own spice blend that includes cumin instead of curry, along with smoked paprika and cayenne pepper to replace the smokiness and spice of the ground sausage. So I don’t know how authentic my vegan version of Chou Farçi tastes, but to my taste buds, it was delicious. As you can see, it makes a dramatic presentation. I decided to call it a main dish rather than a side and 4 servings rather than 6 because I know that when I go to this much trouble to make a dish, I’m not cooking much else! I served it with a big chopped salad and it made 4 filling servings. 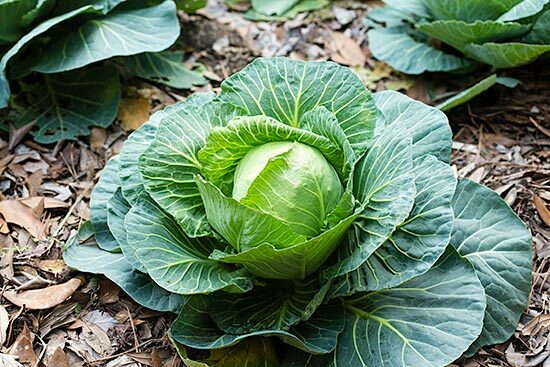 One note about the cabbage: Those outer dark green leaves are beautiful, and it’s tempting to use them rather than discard them, but they are tough. I used one as the first leaf to line my casserole dish so that the top would be pretty, but that leaf was much tougher than the others, and I wound up removing it from each serving. So please throw out those outer leaves and don’t let beauty matter more than flavor! Be sure you have your lentils cooked before beginning this recipe. I like to make both the barley and lentils at least a day or two ahead of time or use canned lentils to save time. 3/4 cup of dried lentils will equal about 1 1/2 cups after they are cooked. First cook the barley (you may do this several days in advance): In the pressure cooker, add the barley, water (or vegetable broth), and bouillon, if needed. Lock the lid and cook at high pressure for 20 minutes. Release the pressure and allow barley to stand covered until all water is absorbed. For regular, non-pressure cooking, bring the water or broth to boil. Add the barley, reduce heat, and simmer for 50 to 60 minutes. If not using right away, place in a storage container and refrigerate. Heat a large, deep skillet. Add the onions and carrots and cook, stirring, until the onions soften, about 4 minutes. Add water by the tablespoon if needed to prevent sticking. Add the barley, cooked lentils, garlic, thyme, bay leaf, and all spices. Cook, stirring, for two minutes. Add the tomato sauce, reduce the heat to low, and cook until the liquid is absorbed, about 5 minutes. Season to taste with salt and pepper. Set aside to cool. Discard the tough outer leaves of the cabbage. Cut around the core and carefully remove about 10 of the largest leaves. If the stem ends of the leaves seem thick, use a vegetable peeler to slice away some of the thickness (see image here). Bring a large pot of water to boil and add the leaves. Boil for 8 minutes. Remove each leaf carefully and allow to drain and cool in a colander. Preheat oven to 350F. Oil a deep 7-inch soufflé or baking dish. Place the largest of the cabbage leaves bowl-side up the the dish, positioned so that it covers the bottom and part of the sides. Repeat with 2 to 4 more leaves until the bottom and sides are covered. Place a layer of barley-lentil filling in the bowl created by the cabbage, using 1/3 of the filling. Smooth it evenly so that it spreads to all sides. Top it with a cabbage leaf. Repeat with two more layers of filling alternating with a cabbage leaf. 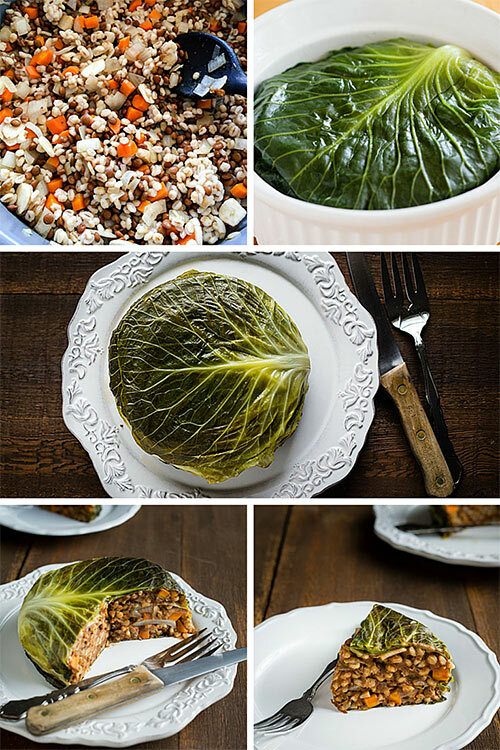 Top with a cabbage leaf, bowl side down, and tuck it in around the sides. Using a large spoon or your hand, press down on the leaf, packing in the filling and making sure there are no air bubbles. Bake uncovered for 30-40 minutes. Remove. Carefully insert a table knife against the edge of the dish and run it around to make sure there are no stuck-on edges. Place an upside-down serving plate on top, and invert the casserole onto the plate. Serve hot. Once serving is 3 points on Weight Watchers Freestyle program. Two servings are 5 points. What a fabulous creation, and what a great use for cabbage! I like the substitutions you chose to make, including the addition of cumin and paprika. I’m not a huge fan of nutmeg. And I like your suggestion for how to simplify the preparation of an otherwise rather complex recipe. Nice presentation too! The dish looks amazing, very posh. Congrats! Wow this is so beautiful! I want to make it right now! Susan, this is the most beautiful presentation of cabbage I have ever seen! I am in love! And ah, the French half of me so approves of your work to veganize this dish. I even love the name. I will have to try this sometime. But for now I am just going to drool over these beautiful photographs of it. I am thinking that maybe buckwheat groats would also work as a gluten free option to barley or farrow. Your cabbage plants should be proud to help produce such a culinary work of art!! Susan, could you make these in the Instant Pot or any electric pressure cooker? Cara, I give instructions for cooking the barley in the pressure cooker, and you could certainly do the lentils and sautéing in it, but there’s no way to cook the entire casserole in the pressure cooker. How wonderful! I avidly read both your and Mimi’s blogs and had actually favorited this particular recipe to see if I could veganize it. I even sent away for the Rabelais spice. What a wonderful surprise to find that you have done this! I can’t wait to attempt this. Thank you so much! Susan: You’re amazing! Thanks so much for doing all this work to bring us this recipe. I can’t wait. I literally just put my barley in the oven (I oven cook all my grains as I have neither rice nor pressure cooker). I’m making this recipe tomorrow. Your cabbage is amazing. I wish I could grow a cabbage like that. This looks just beautiful Susan…thank you for your creation!! Very good job with this dish. I would not,however,dismiss the outer leaves of the cabbage. Yes they are tougher, but using them to line the casserole is a good way to use them. 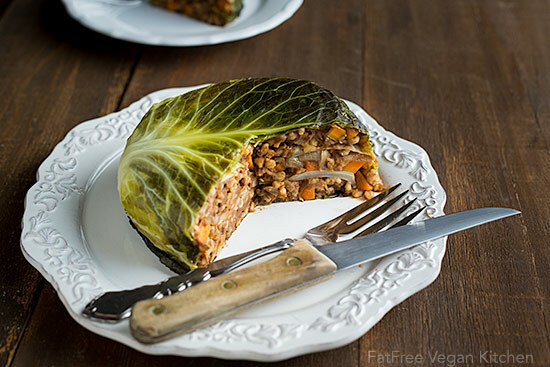 I make a lazy stuffed cabbage dish where I build the dish I a slow cooker, layer by layer, utilizing cooked brown rice, barley, lentils, wheat berries or any other grains along with mushrooms. I add tooled oats to hold the stuffing together. Don’t forget green peppers and sautéed onions for flavor. The cabbage breaks down very tender in the crock pot or after 3-4 hours in a casserole. The tomato sauce provides all the liquid you need. Keep up the good work. Love all your dishes. Do you sell your photos? I have Edward Weston’s “Cabbage Leaf, 1931” framed in my hallway, and I’d love that cabbage photo in my kitchen! Susan: are we supposed to leave out the allspice or add it. From your comments, I’m confused about what to do. Is this spicy? I’m about to add cayenne, but a bit intimidated by it. Skip the cayenne if you don’t like spicy, or cut it down to 1/8 tsp. Use the allspice. The original recipe used more allspice and it was the ONLY spice–that’s what I didn’t like about it. this is beautiful! What an amazing presentation! That dish is stunning! We’ve just planted in our very first allotment (I’m not sure if that’s just a UK thing, but it’s a big of land you rent from the council to grow food on!) and are so excited about all the homemade produce we’ll get! I have all these ingredients, except the cabbage, in my pantry, so I’ll definitely be trying it! Susan: I finally finished this and ended up making it with Napa cabbage that had darker green leaves than the green cabbage in my grocery store. I think it would have worked with Bok Choy leaves too if they are darker green. And I used just one cabbage layer mid-dish to keep it more tender. Anyway, it came out perfectly and we loved it. If I knew how, I’d attach a photo. If you have a juicer, you can juice those tougher outer leaves, and the leaves of broccoli too. 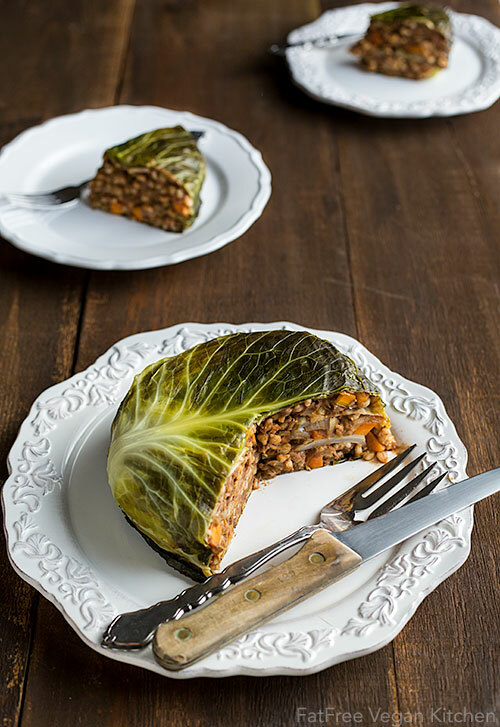 This stuffed cabbage sure looks very beautiful. Use of barley and lentils are certainly my taste. My family loves lentils and this looks like will be great for our Sunday family dinner! thanks for sharing, Susan! loved the recipe. I hope you are doing fine and before I forget Happy Easter. Further, I love all your recipes not that I can make it like you do. I have a request. Can you come up with a good quality recipe with out loosing key nutrients for an INDIAN Bittermelon? It will be a blessing recipe for someone suffering from diabetes. Thank You. Have a nice evening. Never seen such a pretty stuffed cabbage before. It’s really amazingly impressive! Hey Susan, what a beautiful and nourishing dish, would love to have some of that. Also couldn’t help notice you had some difficulties in the garden. Have you tried the mittleider method? with that its practically guaranteed to produce consistent yields of almost any vegetable every year. I made this for dinner earlier this week. What a win! It was totally delicious and pretty. 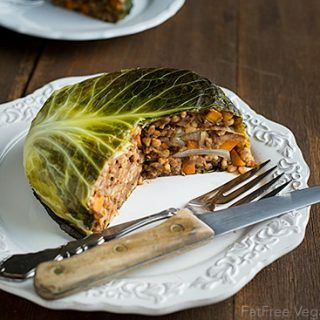 That cabbage stuffed with barley and lentils looks awsome. http://www.veggietips.com is my blog. Check it out. I made this recipe for tonight’s dinner. It was great! My cabbage was small and not as green, so not as pretty. But we loved the taste and the presentation. It will probably be a staple around my house, especially on holidays. I could see that if I changed the basic spices, it could be Italian, or American. Something I might play with. But the spices as they are are so good and different. Very nice! Thanks. This site is my regular go-to spot for many many meals! Looks so delicious and healthy !!!! Will try it. Ooh! I love, love this recipe! I added 4-5 dehydrated shiitake mushrooms (that I turned to powder in the spice grinder) and a splash of tamari just to amp up the umami flavor for my meat eating husband and he loved it! No “you know what would make this better, meat!” Comment at all. Thank you for this recipe. Oh man. I love how decadent this is, i will try this for sure. Has anyone tried assembling this the day before then baking the day of? This dish looks and sounds yummy. I am planning to make for Thanksgiving. Can I put it together one day and bake the next day? We are eating early because we have family that has to work. Thank you. I love our recipes. I don’t see any reason that wouldn’t work. Have a happy Thanksgiving!